In this novella, Morrow’s writing is reminiscent of the best of vaudeville and slapstick humor played out in such a visually stimulating way that one is reminded of great screenplays such as Stanley Kramer’s 1963 movie It’s a Mad, Mad, Mad, Mad World. Morrow’s dialogue is rhythmic, with funny one-liners designed to bring the reader full circle, back to the beginning of each scene. And underlying his witty satirical prose, Morrow cleverly confronts issues concerning the morality of men and the propaganda that surrounds war. The year is 1913, and after viewing an art exhibition in midtown Manhattan, Francis J. Wyndham, “the bookish farm boy from central Pennsylvania,” creates his own art portfolio and sets out for Paris, hoping to become apprentice to Picasso. However, an incident with a jar of azure-tinted turpentine, along with a series of amusing interviews with various artists, leads Wyndham to the position of art therapist at Träumenchen Asylum in Weizenstaat, where he will work under the famed Italian alienist, Dr. Alessandro Caligari. After settling into his apartments at Träumenchen, Wyndham meets with Caligari, who offers his honest thoughts on Wyndham’s personal art portfolio (a scene brimming with hilarious banter). From here, Caligari conducts a tour of the main art studio, stating, “Before meeting your pupils in person, you should get to know them through their art.” Each art student’s character is introduced through delightful prose, setting the stage for more hilarious dialogue and story twists. But it is the artist, Ilona Wessels, “the Spider Queen of Ogyia,” who quickly forges a close relationship with Wyndham. She’s a pearl of a character, a sensitive creative who tempts Wyndham with her unreserved bohemian sexuality. Together, they discover the horrific secret weapon Dr. Caligari is hiding and endeavor to destroy his creation before it destroys the lives of innocent men. Although inspired by the classic 1920s movie The Cabinet of Dr. Caligari, the connections are dipped into gently. For example, Morrow’s use of bridges throughout his story resonates with the haunting bridge scene toward the end of the movie, and, in a dream-like manner act metaphorically as a bridge between the two artistic mediums. Art also binds the two creative pieces together; the ingenious art direction created for the movie that is stylized with the use of perspective, and Morrow’s use of art—in this case a painting titled Ecstatic Wisdom as a main character—is clever, frightening, and exquisite. 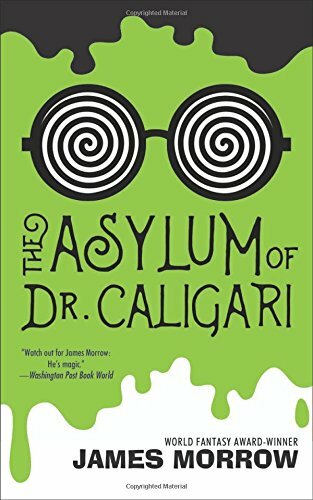 In The Asylum Of Dr. Caligari James Morrow has gifted us with a satirical, thought provoking, and stimulating novella. Morrow’s character and location descriptions are a visual smorgasbord, and at just 182 pages, this clever story is screaming out to be made into a movie.